And now my weekend is scheduled, thank you. Will there be one more announcement regarding festival dj's? I assume jah warrior shelter but I am curious who else? I am hoping yardcore tags along with protoje. You did even better than I expected on limiting conflicts. Warren, Gretchen, Daniel, SNWMF crew...Big up yuhselfs! Has it struck anybody else how wonderful it is that the biggest night of the 20th festival should be dominated by artists who are closely associated with the great Bob Marley? Jah Jah power endureth for i-ver. Edited 1 time(s). Last edit at 06/03/2013 08:07PM by Jah Mike. Edited 1 time(s). Last edit at 06/03/2013 07:58PM by HiGrade1. Feet dont fail me now! Hats off to the logistics committee!!!!! Schedual looks great. 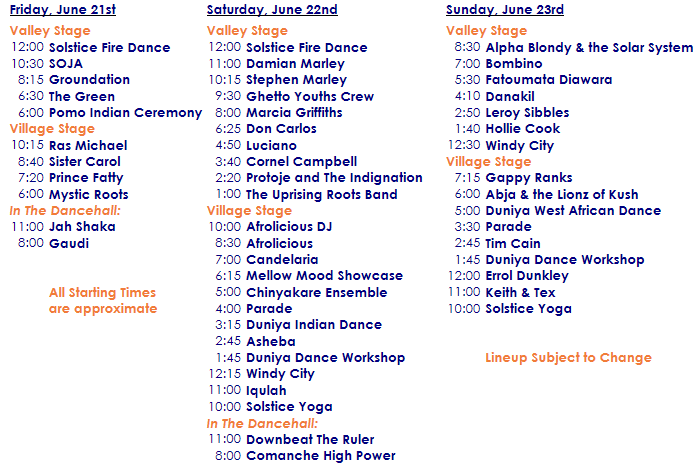 Could someone please explain to me what the mellow mood showcase is all about. The times look really good! Only conflict I saw was Groundation or Sister Carol. Really excited that saturday I can catch Iqulah and Windy City and then get to the main stage for Protoje and the rest of the lineup. Saturday is amazing!! Definatly a backpack day, not heading back to camp. Sunday worked out great too! I can Sibbles, Abja, Gappy and Alpha!! Great lineup! Thanks so much. Speaking of gappy, how long is his set? Do I need to run between stages to see alpha? I really hope to seem some of these stellar artist in the dancehall. Gappy, Romeo, Damian, uroy, sister carol! Dancehall usually goes to at least 2AM. The Valley stage stops at Midnight. not father's day this year so ha! Chai tea latees a plenty for me! yeah i can't believe you didn't bring me one on fathers day.....?! Gotchu covered belated stylee brother. Looks to be a great weekend. Hope to make it back one of these years.